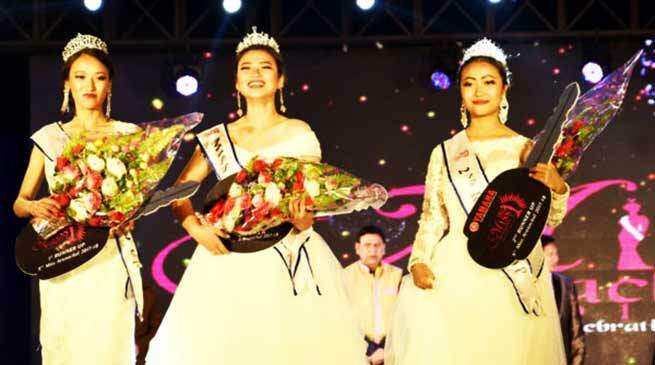 Osin Mosu was crowned Miss Arunachal-2017 while Yangchin Lhamu and Oyi Jamoh were adjudged first and second runners-up from among five contestants in the jury round at Indira Gandhi Park here late Saturday night. The winner was given a Datsun car while both runners-up scooty each. Total 19 contestants were in fray namely Osin Mosu (West Siang), Likha Atu (Papum Pare), Moni Ete (West Siang), Yangchin Lhamu (Tawang), Maidyamsai Tailu (Lohit), Likha Sila (Lower Subansiri), Nang Chandini Namchoom (Namsai), Karsang Nini (Kra Daadi), Oyi Jamoh (East Siang), Minam Yekar (Upper Subansiri), Bompi Zirdo (Lower Siang), Nyater Siram (West Siang), Yupi Gara (Lower Siang), Mary Kardu (Upper Subansiri), Taro Romi (Papum Pare), Tarh Sumpi (Kra Daadi), Heri Sonu (Kra Daadi), Mumtak Rime (Lower Dibang Valley), Nyamron Hacheng (Changlang), of whom 14 were selected after various rounds to face the jury round. Out of 19 contestant the 14 contestants selected after various rounds which include Osin Mosu, Yangchin Lhamu, Maidyamsai Tailu, Likha Sila, Nang Chandini Namchoom, Oyi Jamoh, Minam Yekar, Bompi Zirdo, Nyater Siram, Yupi Gara, Taro Romi, Tarh Sumpi, Heri Sonu & Nyamron Hacheng. Various sub-titles were given away which include Yangchin Lhamu (Miss Congeniality), Maidyamsai Tailu (Miss Talent), Likha Sila (Miss Beautiful Smile), Nang Chandini Namchoom (Miss Photogenic), Nyater Siram (Miss Cat Walk), Tarh Sumpi (Miss Beautiful Hair), Nyamron Hacheng ( Miss Best Costume), who were felicitated by invited guests. Parliamentary Secretary Transport Likha Saya, speaking as chief guest, said that women are unique creations of god who play multifaceted roles as mother, sister, wife, daughters and girl friend to run the society. he said. If the state govt has offered 10% job reservation for sports global, national & regional medal winners, why not job reservation for Ms Arunachal, Arunachal Idol and Arunachal Got Talent winners, he assured to pursue the state govt for such policy besides committed to sponsor the first & second runners-up. Organising committee chairman and Art & Culture Minister Dr Mohesh Chai, as guest of honour, applauded Chief Minister Pema Khandu for his invaluable contribution for the event besides announcement to make Ms Arunachal, Arunachal Idol and Arunachal Got Talent calendar events from next year. Such support would not only provide a befitting official platform to showcase their talents but also catapult them to represent the state at national and international level to win laurels. The gala beauty paegant was punctuated by heart touching entertaining events including melodious numbers while anchor Duyu Tabio continued to inject energy. Judges Duyu Meena Mudang (Mrs India World 2017), Kiran Laishram (Miss India Meghalaya-2017), Kaheli Chophy (Miss India Nagaland-2017), Ribom Basar (Miss Arunachal 1999 & Miss North East 2006, fashion designers included Nabam Aka & Arati Kashyap while organising committee included Kipa Niba (secretary), Tai Rocket (overall in-charge), among others among huge gathering of youths were present on the occasion.